The museum has recently acquired Black Lagoon (2010) by Haim Steinbach for the Hammer Contemporary Collection. Over the past three decades, Steinbach has become known for his sculptures that place ordinary objects on display—some purchased, others borrowed—to explore the intersection of our personal desires, memories, and cultural values. The relationship of the objects to one another can appear non-existent at first glance, but reveals itself to be dense and multilayered after closer inspection. 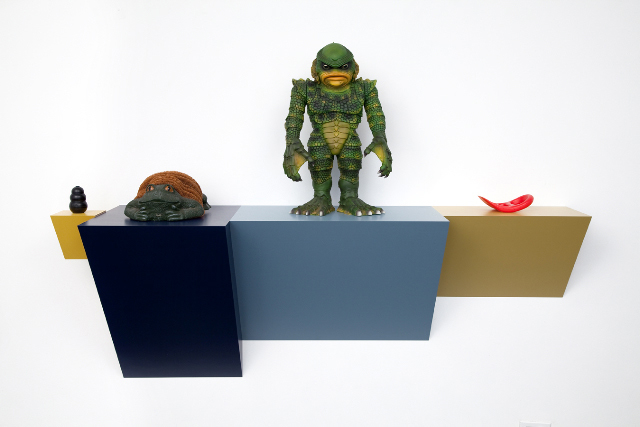 The objects chosen for Black Lagoon refer to amphibious creatures, the natural landscape, and Hollywood’s B-movie past all at once while their boldly-colored shelves recall the geometric forms of modernist sculpture. Haim Stenbach. Black Lagoon, 2010. Plastic laminated wood shelf, rubber dog chew, resin and coir boot scraper, plastic "Creature from the Black Lagoon" figure, plastic sand scooper. 54 ¾ x 68 ½ x 21 inches (136.5 x 174 x 53.3 cm). Hammer Museum. Purchase. Image courtesy Tanya Bonakdar Gallery, New York.